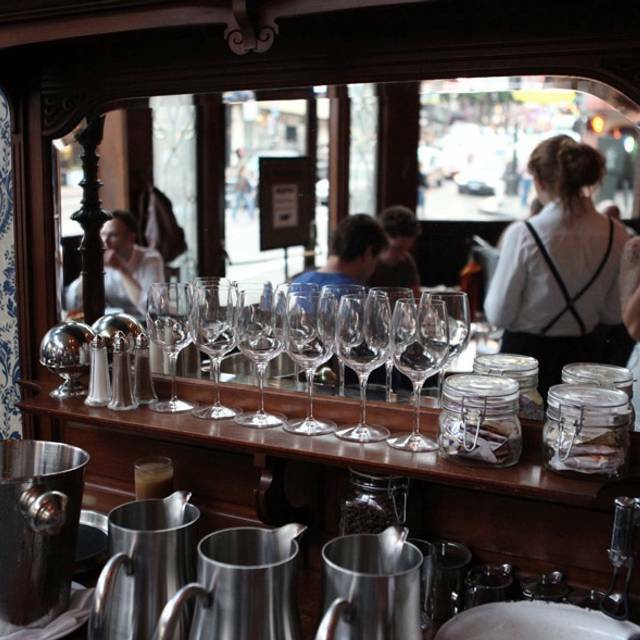 You must make reservations at least 5 minutes in advance of the time at Comstock Saloon. Live music nightly, never a cover. We are open 7 days a week with live music + happy hour specials Monday to Saturday from 4pm to 6pm, and brunch on the weekends! We are open for lunch on Friday's from noon to 4 pm with free lunch available with the purchase of two adult beverages. 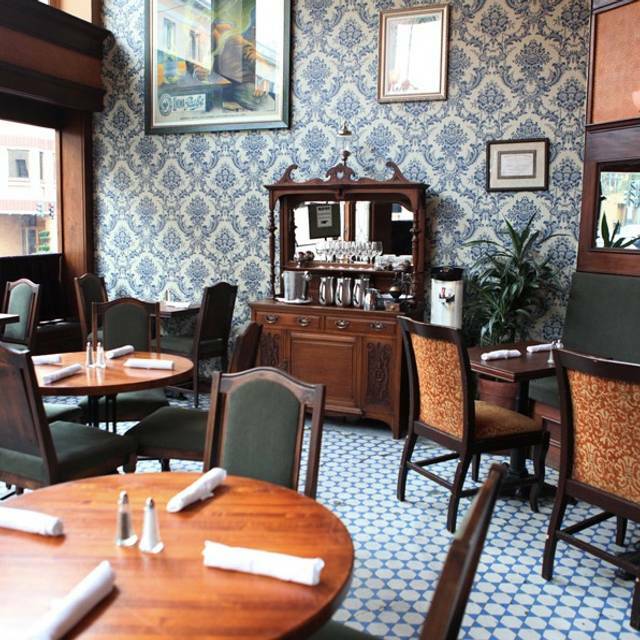 Comstock Saloon’s private dining room is available for hors d’oeuvres and cocktail parties for up to 50 guests. 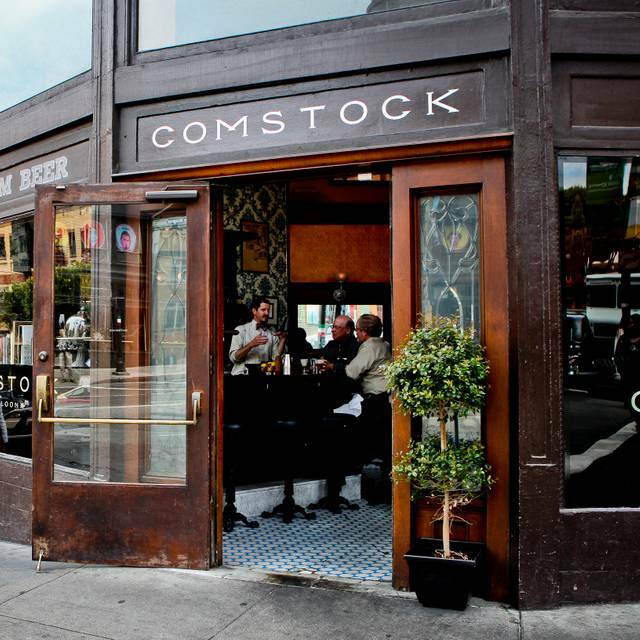 A buyout of Comstock Saloon is available for groups of over 85 people. For more information, please contact Kat Womer at 415-551-1453 or by email at kat@absinthegroup.com. 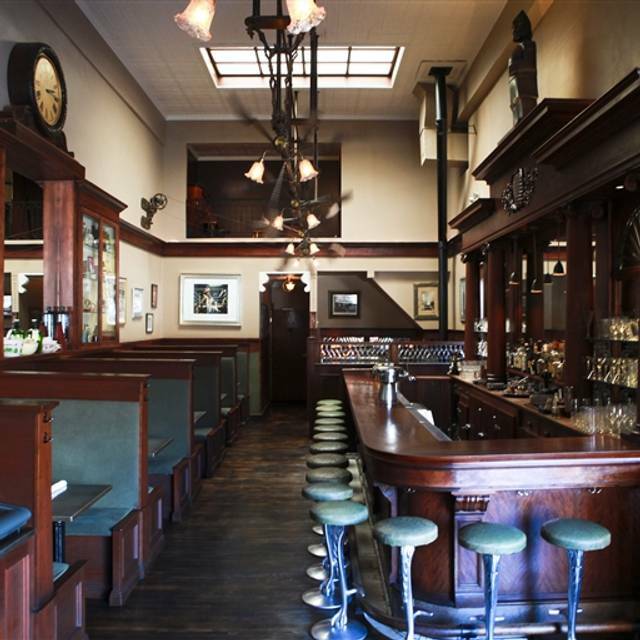 Named after Henry Comstock and the famed Comstock Lode, which brought mining fortunes to the City by the Bay, Comstock Saloon occupies a historic space that has served as a watering hole for San Franciscans since 1907. 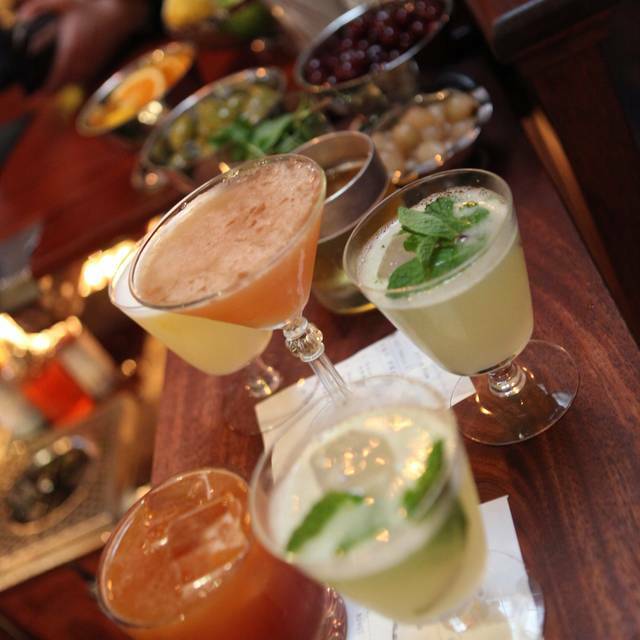 It now offers turn-of-the-century saloon fare and classic cocktails. 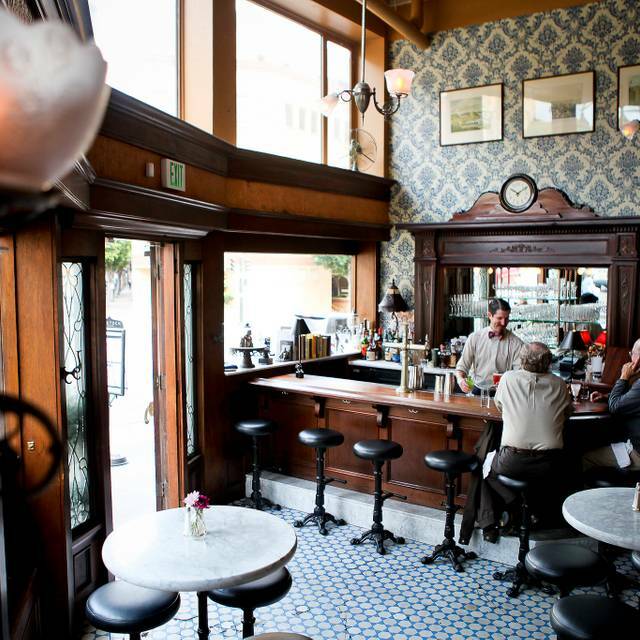 An old school saloon in North Beach, Comstock Saloon also has a great happy hour. Amazing food and pitcher of Pimms Cup. We loved the choices and variety of their brunch menu. I'll definitely be back for more! This is a fascinating, historic place with a very cool fusion menu, reflecting its location between Italian and Chinese neighborhoods. 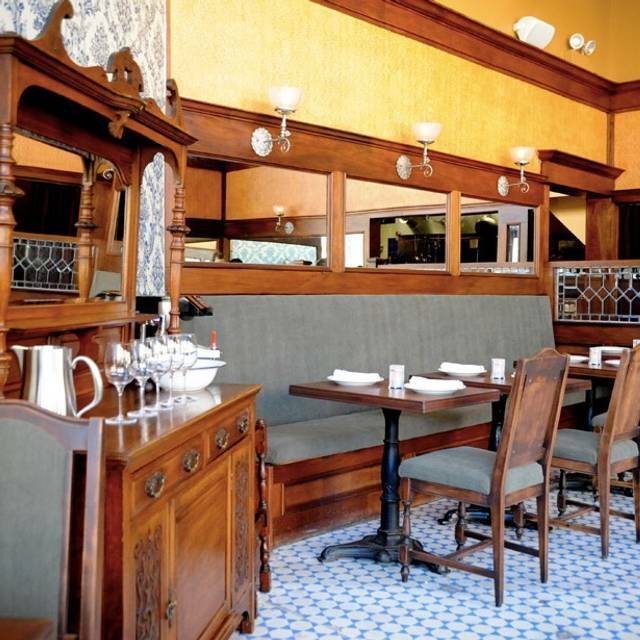 It's an antique-lover's delight -- contrasted with the cutting-edge menu. I had a Benedict that featured a crisp sort of brioche stuffed with Char Siu bbq pork, blanketed in a very good Hollandaise. Though the brunch menu seems a bit limited, the food is so good! I will be back here again. I typically enjoy my experiences at Comstock, but my last visit was not typical. First, they tried to give us a table literally at the door, even though most all of the booths were free. I asked for another seating and they would only give us a table in the back that was very tightly squeezed next to another large group. So much for private conversations. Also, service when ordering was also off this time. Orders came out wrong, and communications crossed. Based on passed experiences I will give probably still give them another try, just not quite yet. Need to let the 'crankiness' of the experience subside. Overall unique menu with classic and unique options. Good portions and quality! The service was slow at first but the waitress was hilarious and gave us some food on the house due to the delay. You can make reservations which is a plus! Disappointed. Waitress had a bad attitude and the food was mediocre. After reading about this place in EATER SF I had high hopes, but won’t go back. It wasn’t terrible, but not great either. The croque monsieur was the best of the dishes we ordered. Amazing!!! The food was so good. Couldn’t have asked for a better birthday brunch. I’d recommend the eggs Benedict, miso tots, and the “egg in a cauldron”. Definitely going back as soon as possible!! Fun window back into old San Francisco with great, original details and live music. We first heard about the Saloon for their amazing cocktails, which are delish. But the food is no slouch either: tasty dishes with generous portions that will leave you happy and satisfied. A perfect pair. The live music is great, but be aware - it's energetic, and can make conversation difficult, except between sets. So, come more to hang out than to catch up. Went for brunch. We didn't like our table so we decided to sit at the bar. Soon after someone came to get us with a better table option. Nice service. The restaurant was busy but the manager was very hands on, helping the staff and making sure everyone was taken care of. Food was delicious. 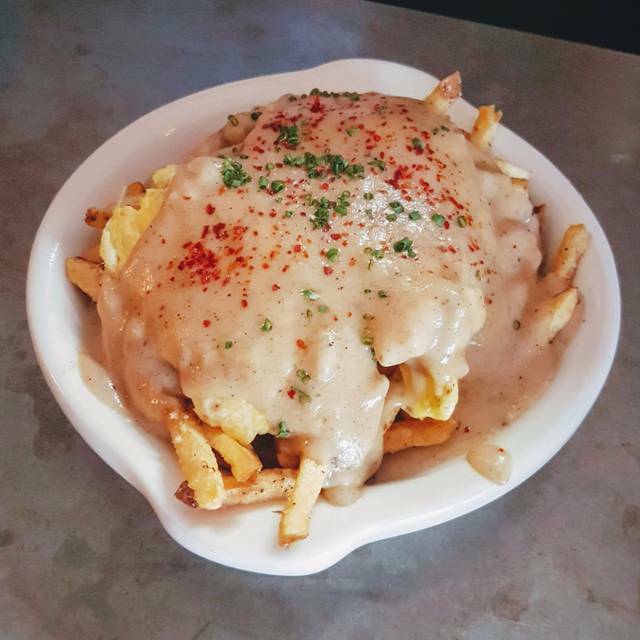 Brunch poutine was awesome. Will go back. I don’t write reviews for every place I visit, but Comstock Saloon is special. I’ve been here three times with different guests each time, and it’s a phenomenal experience every visit. 1) Live Jazz - I’m a musician at heart, and I have been hungering for a great live music joint since I moved to SF half a year ago. When I discovered this place in January, I knew I would be back plenty of times as long as I live in the city. 2) Great Food & Drinks - Reasonably priced and delicious, from cocktails to entrees. Highly recommend the brussel sprouts appetizer. 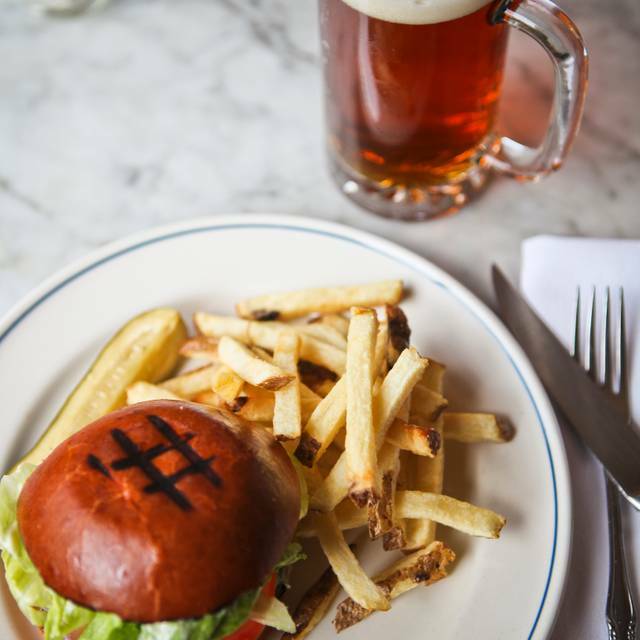 $7 for an Anchor Steam (SF’s signature beer) and $10-$14 for well-crafted cocktails. 3) Friendly Staff - Nearly 0 issues since I’ve been visiting regularly, and the only time there was a mix-up with my reservation, Michael got it taken care of promptly so my date and I could have a fantastic night. I definitely plan to spend some more time at this extraordinarily swank and historic spot. Ambiance was cool. A band played upstairs on a balcony overlooking the dining room. Nothing super exciting on the menu. We ordered multiple starters and entrees but weren't in love with anything. Drinks were yummy. I've been to Comstock (mostly the bar) many times over the years, but this visit to the dining room was such a let down. Once we sat down and viewed the current menu I immediately has hesitations. The menu is extremely limited with a number of "odd" pairings, such as a udon with pesto and a tofu parm. I ordered the udon since they were out of the ribs chow fun, and barely touched my dish. The broccoli rabe tasted burnt and each bite was worse than the last. On top of it the service was very inattentive and never asked why I hadn't touched my food. Dinner for four was over $160 before tip for a disappointing and lackluster meal. Won't be returning anytime soon. Food and service was fantastic. Definitely will come back to taste other food in their menu. They forgot to make my drink, then blamed it on only having one bar tender. They also messed up our parties food order multiple times. Good place if you want to listen to live music in a really busy loud setting and pay for over priced food and cocktails. Very ordinary food. Worst wine I’ve had in a while. Noisy with no music to be heard before the band started after 8 pm. Easy to find much better in San Francisco. Service was pushy and rude on NYE. Very weird vibe. Disappointing. Excellent service and interesting but not intimidating menu with lots of fun little details, like the fact you can order the “family meal”; the one served to the waitstaff, different every night. Great fries, great burger, and excellent cocktail menu. We’ve been three times and would love to go again. Stumbled upon this place looking for good cocktails, found that and more here! Great drinks and the Cacio e Pepe was spectacular!! Definitely will come back. It is a bit pricey though ($18 for a calamari appetizer ?!) but the food is so good. I was in town for business and made a reservation about 45 minutes before our arrival for Sunday brunch on 12/16/2018 and arrived by 12:30pm. When we arrived we were immediately escorted to a table with bar stools in the front room by the bar. We had asked if there were additional seating available and the hostess said let me check. She brought us into the back room where there were a handful of tables available, most were booths. She had sat us at a very small table by the door and said “sorry this as good as it gets”. My business partner and I were both taken aback but the comment. She said the other tables were for later parties and that they were reserved. Mind you the restaurant was not busy. In fact it seemed extremely slow for a Sunday at 12:30. I had noticed other booths with couple siting in them so we were confused as to why we weren’t allowed sit there. We had planned on order multiple dishes each and knew that we wouldn’t be able to accommodate our food on aug a small table. Also the table was by a door so there was a draft. I had asked a female manger who came to our table and she said hold on let me see. She can’t back to our table and said no and that again the tables were for reservations only. I had expressed we had a reservation said “oh”. She left and far back about 10 minutes later. She knelt down next to our table and said to me “these tables are for reservations and you only hire booked yours 20 minutes ago”. We were very confused as to not only why she would come back to say that, but also what does it mater how far in advanced we booked the table online. She said it in a try condescending tone. As if to say sorry your reservation isn’t good enough and she just stood tree staring at us not saying a word. It was the most bizarre encounter I ot my colleague have ever experienced and I dine out 2-3 meals a day 7 days a week. I then told her I felt uncomfortable in that moment and she shrugged her shoulders and smirked. Don’t waste your time. I've had delicious dinners at the Comstock before. This last visit was a mix of excellent and disappointing... The oysters were rather warm and full of broken shell. Most of the waitstaff were amazing, friendly, responsive, delightful... but the bartender in the back room insisted on "airing out the room" occasionally by throwing the doors wide open and causing all of the patrons to suddenly put on their winter coats. It was 40 degrees out and pretty unpleasant to sit in the breeze because he happened to be warm. His response to patrons about this was rude and unapologetic. I can so do without hipster attitude from people in the service industry. The restaurant should find another way to get a little more fresh air in that back room besides freezing the patrons periodically and cooling off their food. The "family meal" was curried udon noodles with pork belly and was soo delicious. Spent Sunday afternoon here for an early birthday lunch and had such a fun time. Food, drinks & service were all top notch. The french fries were especially amazing! Good food and service. Good vibe. Sense of history in menu, drinks and food, is nice. Beautiful bar. Wonderful staff, wonderful brunch. SF suffers from pretentious eating - you will not find that here! Great for drinks and live music, but would not recommend for dinner. The sauce for the calamari appetizer was way too salty and not enough calamari. The main dishes were ok, but did not have any accompanying sides for the prices. The live music was surburb and looking forward to returning for that with cocktails. Found myself desperate to hear some live music on Saturday, and the jazz men of Comstock Saloon always reliably deliver. Very high level of musicianship and an awesome location in which to appreciate it. The cocktails are truly exceptional. I won’t judge the menu by the really bad $9 tater tots I ordered, but you may just want to enjoy the jazz and cocktails. My favorite burger in town with the best service and staff. Jason Raffin's creative menu and delicious food never fail to disappoint along with outstanding saloon service. Overall we enjoyed the food and ambiance. The service was great too. I am deducting a star because I asked if my egg yolk would be runny since the eggs dish I ordered was baked and the waitress assured me the egg yolk would be runny but the egg whites would not be; however the egg yolk was hard. The dish itself was delicious but it would have been even tastier to me if the egg yolks would have been runny. I would have ordered a different dish had the waitress given me accurate information. Fantastic piece of San Franciscan history. I have always loved this place and I think it’s even nicer now after the remodel. Upgraded the seating but left this historical bar and everything else that should have been left. Great place for weekend brunch. Drinks were great.